India is currently the second-largest telecommunications market in the world. Internet penetration in India stands at about 28.7 percent now. It has been broadly estimated that a 10 percent increase in broadband penetration in a country could potentially lead to an over 1 percent increase in GDP. 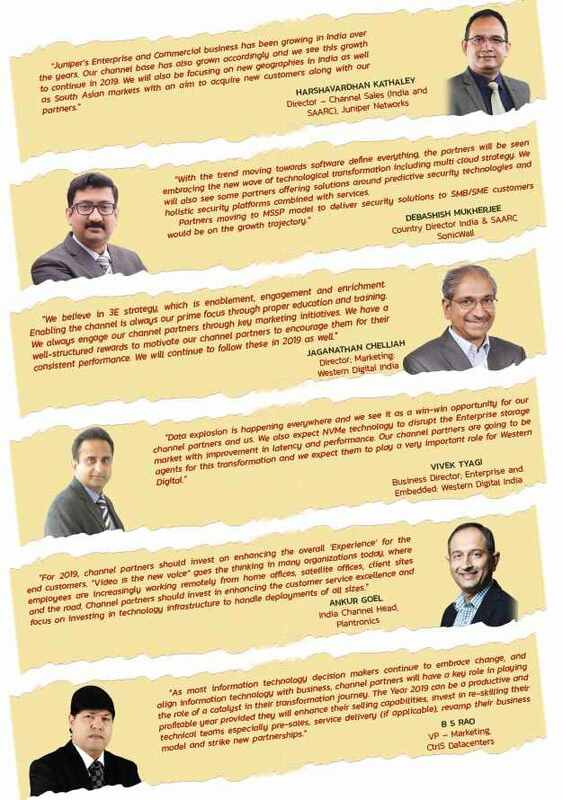 The Ministry of Communications & IT says that the Digital India programme is a $1-trillion business opportunity. The growth of connectivity largely depends on the increase in the number of Wi-Fi hotspots in the country. In the current scenario, a significant portion of the population does not have access to an internet connection. It is important to chart out a definite plan to work towards the government’s vision to have 7.5 lakh Wi-Fi public hotspots by the end of this year. At the same time cyber threat is the biggest concern. Even some “next-generation” solutions don’t provide enough protection, leaving a company’s staff to integrate a patchwork of endpoint agents. Technology will play an increasing role in healthcare consultation, patient care and medicine delivery. We expect that digital adoption will be a significant contributor to the overall Indian healthcare market that is worth $100 billion and is expected to grow at a 23% CAGR to reach $280 billion by 2020. At the same time, there is also a sharp increase in the adoption of E-commerce in India. Going forward, the age of Robotic Process Automation (RPA) will give way to the new wave of Digital Process Automation (DPA) and Business Process Automation (BPA). Intelligent Process Automation (IPA) is also a new trend, applying Artificial Intelligence and related new technologies like Cognitive Automation, Machine Learning and Computer Vision to Robotic Process Automation. Intelligent & Robotic Process Automation (I&RPA) is a new and revolutionary process which is driving cost-effective business operations through the rapid automation of administrative processes, with or without deploying machine learning and artificial intelligence. 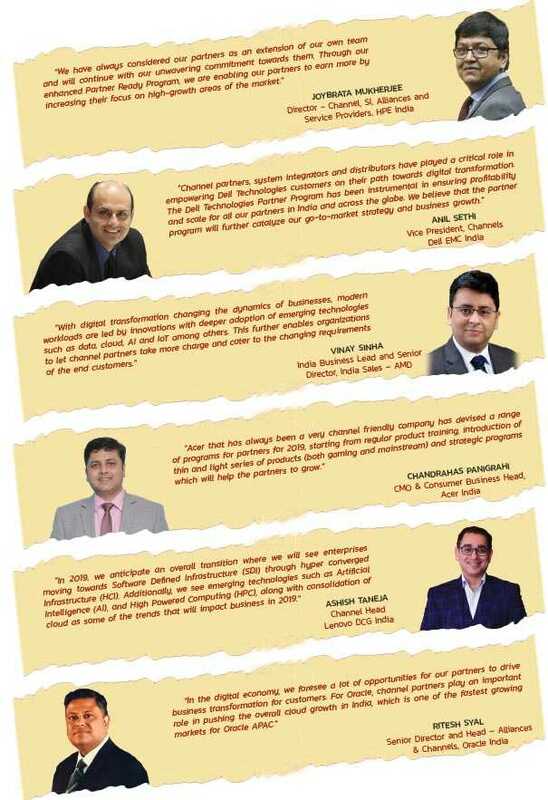 The score card (that is ranked on a scale from 5 star to 3 Star) brought out by VARINDIA in this issue is based on Seven (7) important factors - Product Availability, Price Performance, Channel Profitability, Pre -sales support, Training and Certification, Channel Policy and Post-sales Support. This score card is based on the response we could gather from the feedback received from 300 partners in the Metros and A class cities in India. However, this report does not reflect any response from the customers and users. VARs look to vendor partners for help with pre-sales and post-sales support, marketing support and training. Vendors that were able to work with partners and provide high-quality products at good prices were rewarded with high scores. With the strong penetration of E-commerce companies (From B2B to B2C segments) including Flipkart, Amazon, Alibaba, Udaan and few others in India from Tier to II to Tier VI cities in India, there are various vendors which have gained a good number of market share. eCommerce companies like Naaptol is targeting houses. New Foreign Direct Investment (FDI) rules in E-commerce , intended at providing a level-playing field to Indian brick-and-mortar stores, came into effect since February 1. The government’s new FDI rule has also debarred online marketplaces from manipulating the price of products or offer deep discounts. Distributors and value Added Distributors (VADs) possess a very important role in the overall growth strategy of the corporates. Moreover, channel partners are integral to overall success of the corporates go-to-market strategy for delivering an excellent customer experience. The distributors are well on their way to align their business models more closely with their tech vendors by providing highly-skilled technical support to offer deep expertise for world-class customer satisfaction. Similarly, Value Added Distributors (VADs) are accelerating the sale of product and solutions into the market place with focus on incentives to drive reseller growth. Secondly, VADs are aimed at creating an enhanced and superior level of service for partners and customers on the latest technologies and the role is built on a unique business model with a specialized resource portfolio optimized for increasing adoption and market development of specialty solutions. This year, distributors have realized the massive opportunities in E-commerce , Cloud Computing and Cyber Security. 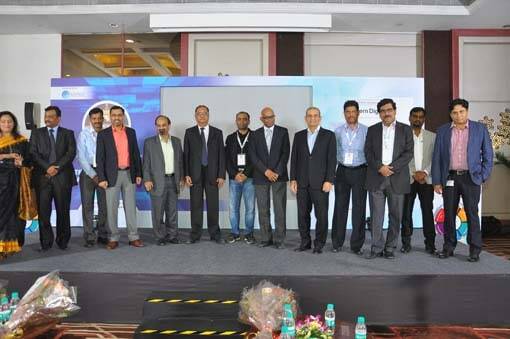 Thus, majors like Ingram Micro, Redington, Savex are positioned as the top three players in the Indian market, while other distribution majors including Compuage, Supertron, Rashi Peripherals, Brightstar and HCL Infosystems have gone very aggressive, by promoting various offerings to the channel through cloud and security as services for enabling digital transformation for industries. The report we could receive from the partners who are directly dealing in the partner eco-system doesn’t include the sales that happened through various E-commerce companies in India, which is a big chunk and the figures are very difficult to find. The reason behind this is most of the vendors have cleared their old inventories, through the E-commerce players to reach to the remote parts in the country, where certain distributors and partners were directly involved in the transactions with E-commerce companies. With rising use of the Internet and smartphones in India, online retailers have doled out discounts to lure people to shop online for everything from basic groceries to large electronic devices (PC, Laptop, Printer, Camera, Mobile phones and various accessories). 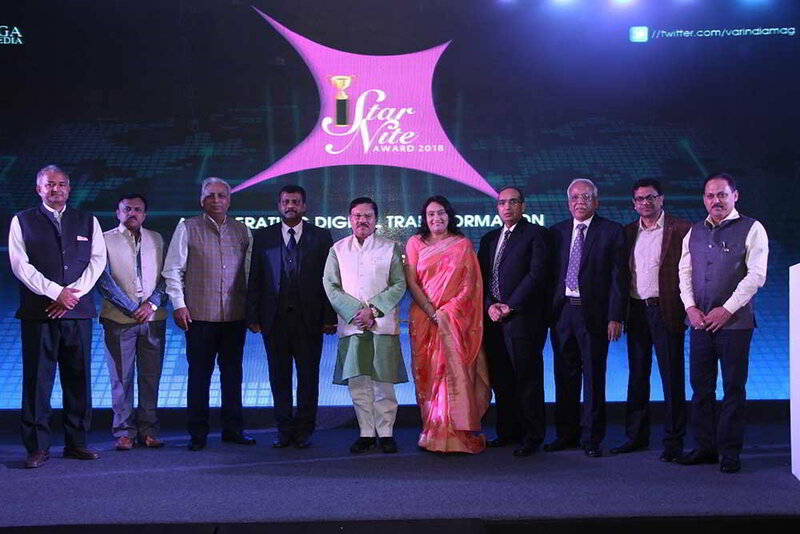 E-commerce has transformed the way business is done in India. 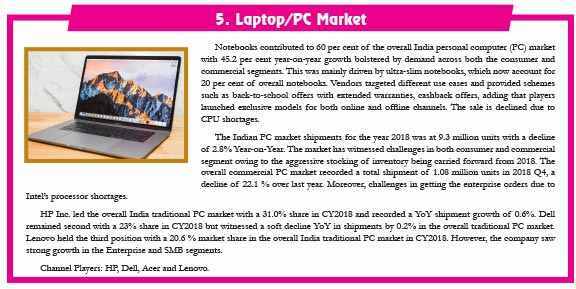 During 2018, electronics is currently the biggest contributor to online retail sales in India with a share of 48 to 50 per cent. After Flipkart, Amazon, Alibaba, Snapdeal and OLX, Udaan is now disrupting the B2B business in India. The market is shifting with various disruptive mechanisms existing in the market and we have seen the influence of hardware growing steadily, which will really hit its stride in 2019. The leading enterprises of the world are looking to deploy their technology opinion quickly and at global scale. From 5G to mobility to mobile gaming, this ambition requires a “go anywhere” model that enables cloud-style infrastructure in hundreds or thousands of locations. Lastly, in 2019, “edge computing” is to take the front seat, reason it is near to the source of the data, rather than relying on faraway cloud datacenters to do the work. The edge will become the most exciting frontier in the cloud. With the shifting of technology, there are massive opportunities coming in the marketplace, where customers will look into channel as their trusted advisor. HP and Dell has emerged as the strong channel player. 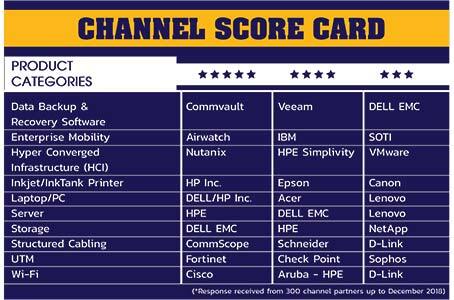 Channel partners are a key stakeholder of HP and its commitment to partners will continue to grow deeper and stronger. The recent initiative by HP Inc. has revealed a new financing solution and training enhancements to help provide further support for its channel partners in their services-led model in the market through HP Integrated Financial Solutions (HPSC). It offers instant credit approval, mobile apps, automated document management, electronic signature and invoicing for customers. At the same time, Dell Technologies Partner Program aims a hooping $70B channel sales in 2019. This is quite impressive and is possible with the continued evolution of its GTM programs, profitable storage initiatives, impactful marketing campaigns, and improvements with the partner for closing deals and helping them grow their business in double digits. In 2018 Dell spoke about USD 43 billion business in the channel for Dell Technologies. Over the past 12 months, Dell Technologies’ global channel has delivered over USD 49 billion in orders. It means that the channel has grown its businesses by USD 6 billion. At the same time, CISCO are building an adept channel army for the modern world and pursuing different GTM for the broader ecosystem - beyond resellers and distributors - ensuring maximum partner profitability. Commvault who is into enterprise backup, recovery, and data management is showing its commitment as a pure channel play. Similarly, Fortinet feels that partners have a sizable business opportunity in helping customers successfully address today’s security challenges. Sophos has continued its position as the channel first organisation, with a strong presence of 2000+ channel partners across major tier 1, 2 and tier 3 cities and towns that enable organizations of all sizes to deploy cloud enabled next-generation cyber security. As the industry adopts new technologies like AI, machine learning (ML), data analytics, automation, robotics, blockchain, cloud and the Internet of Things (IoT), companies with legacy systems and obsolete workforce will face challenges to survive the disruption. “We see several trends emerging that will impact channel growth. Firstly, there has been substantial investments in the tier two cities in India. These investments will include critical infrastructure that will lay the foundation of high-speed broadband as the nation embraces digitalization. We will also see more opportunities as new start-ups from installer base join the partner ecosystem. We will continue to see greater opportunities on the shift from ‘old school’ datacenters to Hyperscale and Multi-Tenant Data Centres (MTDCs). CommScope believes that strong collaboration between Partner, CommScope and customer—sharing the goal of solving a problem, is the best way to bring CommScope solutions to market. “Seagate understands the challenges facing IT and storage managers, and as such we evolve our programme in line with our channel partners’ needs and concerns to create a vital platform for them to become more successful in this dynamic industry. We see ourselves as not just a storage provider, but a business partner who can build best-in-class solutions together with our channel partners – from the first stage of projects to developing a solutions pipeline to provide consultation, establish systems and provide technical support. “The YoY channel business growth will be double digit in 2019. However, consumer products will slowly move to E-commerce and commercial business opportunity will come to channel partners. In short, it is imperative for channel partners to focus on SMB, Enterprise and Government business for long term sustainability and growth. 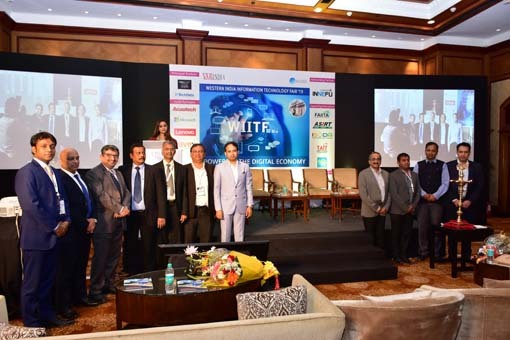 Further, they need to step into Software and Cloud space and thereby get into indirect services, which will improve their customer stickiness with them. Flash is already replacing the standard hard drive market and this transition is happening at a rapid pace. Hybrid cloud will be the game changer in the coming two to three years as it provides safety, security and save on the capex cost. Educating the end customers, training them and implementing their projects will be the key for channel partners in this transition. “Kingston has always believed in extending its support to our channel network and create benefits for the end users. 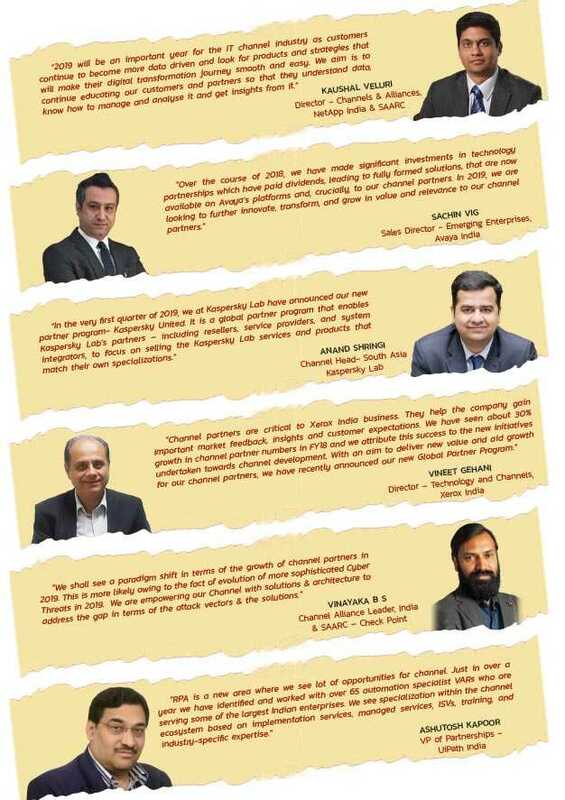 With our definite and competitive business strategies in 2019, part of our focus area will involve channel engagement and empowerment activities, developing our network and rapidly increasing channel strength to establish a strong foothold in various regional markets. The structure that we have integrated in our business operations is crafted to build a profitable relationship which has helped us in creating a robust and responsive network of partners in the country. In a volatile market like India, our partners have emerged as a crucial element of our growth engine by bridging the gap between us and the customer through constant communication. Hence, we are aiming to help our channel partner to develop a deeper understanding of consumer preferences through a better model of communication. “The vision for 2019 is to grow our business and be relevant to the marketplace. So if you look worldwide, the space where Veeam has been operating, we have seen a double digit growth in consecutive several quarters. 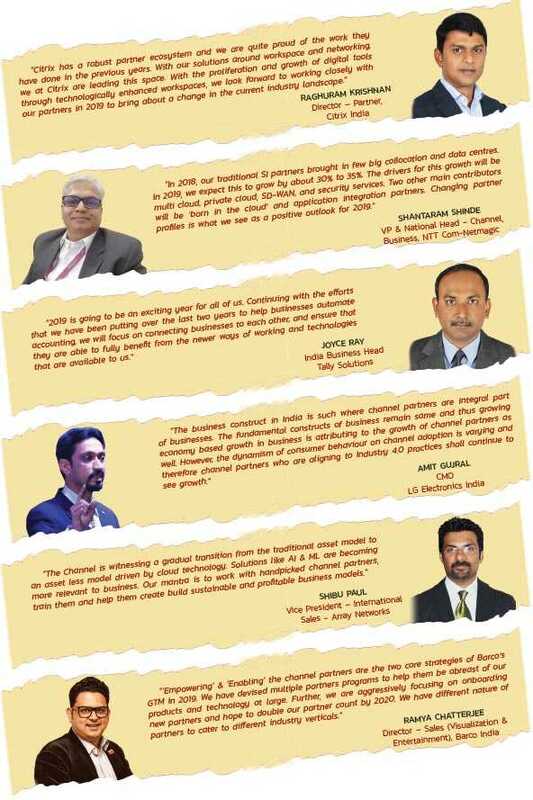 India and SAARC business has specifically been doing extremely well for us. We have seen a triple digit growth in customer acquisition and revenues and have been able to put together a very strong sales team. In order to cover a large base of commercial and SMB businesses, we have formed an inside sales organization as well. So with this we are able to address a much larger base of customers across India and SAARC.